Colors for Men is designed to help you, the culturally color-ignorant man, to understand what the heck people are talking about when they say fushia. Face it, most of us know 7 colors, red, green, white, black, blue, yellow and brown. Using Colors for Men fixes that! Download it, and launch, and the first thing you'll see is the master color list. If you're looking for the Colors for Men editor, it's at the bottom of this page. Broswe the list, search by name, sort by name or color hue. The color box shows you more of the color. You can add notes(like Her Favorite Color). You can also add this color to a collection, more on that later. The color fills the screen, with some interesting additions. You can get the color numeric value from the info box, and CFM adds two racing stripesdown the center of the color. You can tap on those to select a color to contrast with the master color, to see how colors may work together. The Collections button allows you to add that color to any of the collections you've created or had sent to you. In the Collections tab you can create or delete collections, and tap on the collection to see all the colors within it. Tapping the envelope icon allows you to send any of your collections to freinds to share your colors. Adding your own colors is easy. Tap on the Capture tab and the color selector will appear. You can pick a picture from your current library, or take a picture of a color you want to remember. Move your finger around the image to move the blue crosshair, name hte color, and tap Createto add the color to your collection. Creating colors on your iOS device is quick and fun. However, sometimes you want to make a lot of colors, or easily manage a few color collections. To help you with that we've created the Colors for Men editor. Download Colors for Men editor. Note: This is a Mac app. There is no Windows version. The table on the left holds all the colors that Colors for Men knows about. Select any color and it's name, notes, and the color will be placed in the top center fields. You can change the name, add or delete notes, and even change the color. Adding a new color is easy. Click the "+" button at the bottom of the table and a new color will be added. It defaults to Red. Click the color well and the standard OS X color picker will appear. Use the color picker to choose the color you want, either from the built-in palletes or by using the maginfying glass tool. The magnifying glass tool is great for getting colors from pictures you've taken, or from a web site. Add all the colors you want! The Colors for Men editors' main purpose is to allow you to quickly and easily make color collections to share with your significant other, freinds, and whoever else you want to share colors with. Create a collection by clicking on the "+" button under the Collections list. It will create a new collection named untitled, double-click on the name to change it to what you would like. 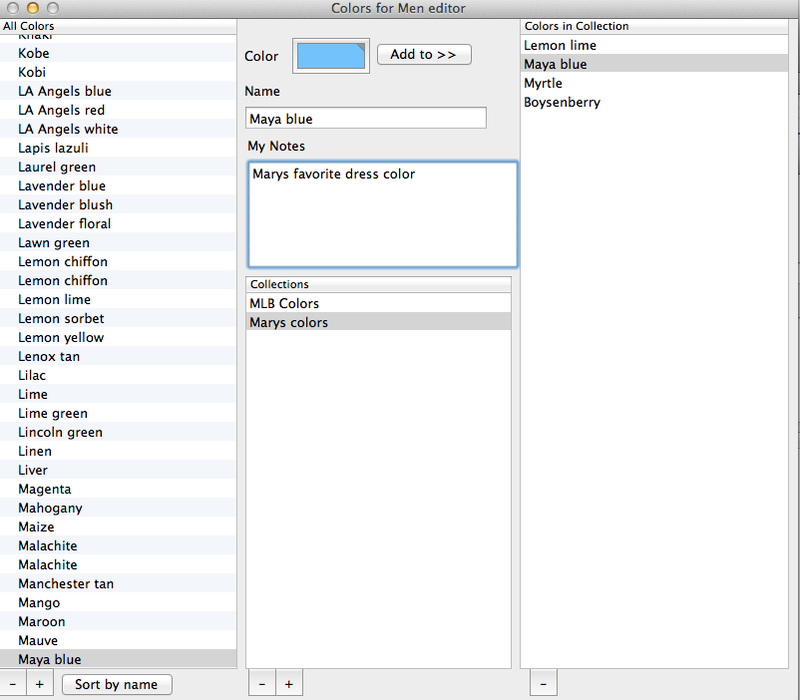 Then move any colors from the master color list to the Colors in Collection list on the right. You can select a color and click the Add to button, or you can drag the color from the master collection to the Colors in Collection list. You can tehn select the Save or Save as menu items to save this new collection whereever you would like. Then you can send that collection to a friend using Colors for Men on their iOS device and they will have your favorite colors! Colors for Men will remember all your collections, and will prompt you to save your colors when you quit in case you haven't already.